If there was ever a timeless hero, surely it’s Anne Frank, the German-born girl forced to go into hiding with her family during the Second World War because they were Jewish. 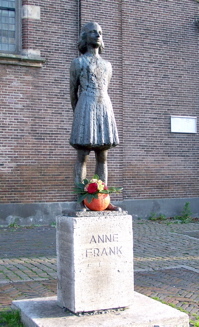 Anne’s family moved to Amsterdam, Holland, in 1933, after the Nazis gained power in Germany. But then the Nazis attacked and occupied Holland in 1940. Nazi persecution of Jews increased relentlessly. In June 1942, Anne received a book she had spotted in a shop window—a red-and-green plaid autograph book, with a small lock—for her 13th birthday. She decided to use it as a diary. The following month, July, Anne’s older sister Margot got a call-up notice. It ordered her to report for relocation to a German work camp. The entire family faced arrest if Margot didn’t obey. Instead, the Frank family went into hiding in a concealed apartment prepared by father Otto in his office building. Because of the desperate need for secrecy, they had to leave Anne's cat behind. The Frank family was joined by four other Jewish refugees—a couple with a teenage son, and an unmarried gentleman friend of the family. They all hid in the apartment for two years. But someone betrayed them. The German Security Police stormed their hiding place. At Auschwitz concentration camp, the Nazis forced the men to separate from the women and children. 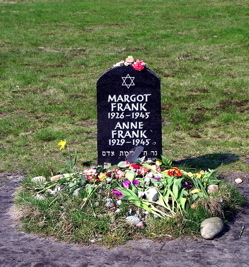 Later Anne and Margot were transported to Bergen-Belsen camp. Their mother was left behind and died from starvation. Seven months after her arrest, Anne Frank, the outspoken, energetic and extroverted youngster who dreamed of becoming an author, died in the same typhus epidemic that killed her sister—and about 17,000 other Bergen-Belsen prisoners. Anne was 15. After the war, Anne’s father returned to Amsterdam, hoping his family might have survived. A Dutch woman who had helped the Frank family during the war had found and saved Anne’s diary. Otto’s efforts led to publication in 1947. The book (which Anne wrote from 12 June 1942 until 1 August 1944) appeared in English in 1952, as The Diary of a Young Girl . Translated into many languages, Anne Frank’s diary has become one of the world's most widely read books, the source of the many and varied Anne Frank quotes, and the basis for several plays and films. It has secured Anne’s place in history as a writer and a humanist. The wisdom in an Anne Frank quote is as valid now as back when Anne lived—and died—for the so-called “crime” of being Jewish. - I don't think of all the misery, but of the beauty that still remains. - You can always, always give something, even if it is only kindness! - I am my own skipper, and later on I shall see where I come to land. - How wonderful it is that nobody need wait a single moment before beginning to improve the world. - And finally I twist my heart round again, so that the bad is on the outside and the good is on the inside, and keep on trying to find a way of becoming what I would so like to be. - Everyone has inside of him a piece of good news. The good news is that you don't know how great you can be! How much you can love! What you can accomplish! And what your potential is! - I've found that there is always some beauty left—in nature, sunshine, freedom, in yourself; these can help you. Look at these things, then find yourself again, and God, and then you regain your balance. - How lovely to think that no one need wait a moment, we can start now, start slowly changing the world! How lovely that everyone, great and small, can make their contribution toward introducing justice straightaway. - I have often been downcast, but never in despair; I regard our hiding as a dangerous adventure, romantic and interesting at the same time. In my diary I treat all the privations as amusing. I have made up my mind now to lead a different life from other girls and, later on, different from ordinary housewives. My start has been so very full of interest, and that is the sole reason why I have to laugh at the humorous side of the most dangerous moments. - He who has courage and faith will never perish in misery! - I have lots of courage. I always feel so strong, as if I can bear a great deal. - I long for Daddy's real love: not only as his child, but for me—Anne, myself. - Parents can only give (children) good advice or put them on their right paths, but the final forming of a person lies in their own hands. - I soothe my conscience now with the thought that it is better for hard words to be on paper than that Mummy should carry them in her heart. - I trust to luck and do nothing but work, hoping that all will end well. - Will this year, 1944, bring us victory? We don't know yet. But where there's hope, there's life. It fills us with fresh courage and makes us strong again. We'll need to be brave to endure the many fears and hardships and the suffering yet to come. - Why do grown-ups quarrel so easily, so much, and over the most idiotic things? - We all live with the objective of being happy, our lives are all different and yet the same. - People will always follow a good example; be the one to set a good example, then it won't be long before the others follow. - The only way to truly know a person is to argue with them. For when they argue in full swing, then they reveal their true character. - It's difficult in times like these: ideals, dreams and cherished hopes rise within us, only to be crushed by grim reality. It’s really a wonder that I haven’t dropped all my ideals because they seem so absurd and impossible to carry out. Yet, I keep them, because in spite of everything I still believe that people are really good at heart. I simply can’t build up my hopes on a foundation consisting of confusion, misery, and death. I see the world gradually being turned into a wilderness, I hear the ever-approaching thunder, which will destroy us too, I can feel the sufferings of millions and yet, if I look up into the heavens, I think that it will all come right, that this cruelty too will end, and that peace and tranquility will return again. - Who has allowed us to suffer so terribly up til now? - Right through the ages there were Jews. Through the ages they suffered, but it also made us strong. - Today I have nothing but dismal and depressing news to report. Our many Jewish friends and acquaintances are being taken away in droves. - My advice is: "Go outside, to the fields, enjoy nature and the sunshine, go out and try to recapture happiness in yourself and in God. Think of all the beauty that's still left in and around you and be happy!" - The best remedy for those who are afraid, lonely or unhappy is to go outside, somewhere where they can be quiet, alone with the heavens, nature and God. Because only then does one feel that all is as it should be and that God wishes to see people happy, amidst the simple beauty of nature. As long as this exists, and it certainly always will, I know that then there will always be comfort for every sorrow, whatever the circumstances may be. And I firmly believe that nature brings solace in all troubles. - My happy-go-lucky, carefree school days are gone forever. - Not being able to go outside upsets me more than I can say, and I'm terrified our hiding place will be discovered and that we'll be shot. - There is nothing we can do but wait as calmly as we can till the misery comes to an end. Jews and Christians wait, the whole Earth waits; and there are many who wait for death. - I don’t believe that the big men, the politicians and the capitalists alone are guilty of the war. Oh, no, the little man is just as keen, otherwise the people of the world would have risen in revolt long ago! There is an urge and rage in people to destroy, to kill, to murder, and until all mankind, without exception, undergoes a great change, wars will be waged, everything that has been built up, cultivated and grown, will be destroyed and disfigured, after which mankind will have to begin all over again. - We often ask ourselves here despairingly: “What, oh, what is the use of the war? Why can’t people live peacefully together? Why all this destruction?” The question is very understandable, but no one has found a satisfactory answer to it so far. Yes, why do they make still more gigantic planes, still heavier bombs and, at the same time, prefabricated houses for reconstruction? Why should millions be spent daily on the war and yet there’s not a penny available for medical services, artists, or for poor people?... Oh, why are people so crazy? - I must have something besides a husband and children, something that I can devote myself to! - I believe that in the course of the next (21st) century the notion that it's a woman's duty to have children will change and make way for the respect and admiration of all women, who bear their burdens without complaint or a lot of pompous words! - I must work, so as not to be a fool. - I can’t understand people who don’t like work. - I shall not remain insignificant, I shall work in the world and for mankind! - You must work and do good, not be lazy and gamble, if you wish to earn happiness. Laziness may appear attractive, but work gives satisfaction. - My mind boggles at the profanity this honourable house has had to endure in the past month… To tell you the truth, I sometimes forget who we're at odds with and who we're not. The only way to take my mind off it is to study, and I've been doing a lot of that lately. - The nicest part is being able to write down all my thoughts and feelings, otherwise I'd absolutely suffocate. - I don't want to have lived in vain like most people. I want to be useful or bring enjoyment to people, even those I've never met. I want to go on living even after my death! And that's why I'm grateful to God for having given me this gift, which I can use to develop and to express all that's inside me! - I can shake off everything if I write; my sorrows disappear, my courage is reborn. But, and that is the great question, will I ever be able to write anything great, will I ever become a journalist or a writer? I hope so, oh, I hope so very much, for I can recapture everything when I write, my thoughts, my ideals and my fantasies. - Who would ever think that so much went on in the soul of a young girl? - Most of all I long to have a home of our own, to be able to move around freely and have someone help me with my homework again, at last. In other words, to go back to school! - People can tell you to keep your mouth shut, but it doesn't stop you having your own opinions. Even if people are still very young, they shouldn't be prevented from saying what they think.